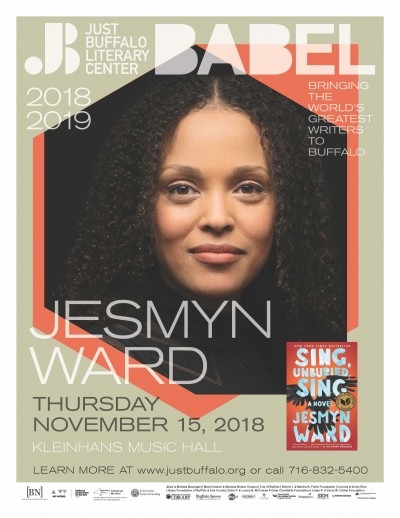 At 8:00 p.m. on Thursday, November 15th, 2018 Just Buffalo Literary Center’s BABEL season continues with Mississippi native Jesmyn Ward at Kleinhans Music Hall (3 Symphony Circle). Her most recent novel, Sing, Unburied, Sing, is part road trip, part ghost story, part reportage of the opioid and drug epidemics taking place throughout rural America, and the most praised novel of 2017. Ward won her second National Book Award for her efforts—becoming the first woman to ever do so. Ward won her first National Book Award for Salvage the Bones, a novel which follows a family escaping the wraths of Hurricane Katrina. Ward told the Paris Review, “I wrote about the storm because I was dissatisfied with the way it had receded from public consciousness.” This receding from public consciousness is applicable to all of Ward’s work as the specter of the past is always haunting the present. The evening will provide a rare opportunity to meet the author, and learn about her work. After Ward’s talk, there will be an audience-generated Q&A. Audience questions can be submitted prior to the event by email (submissions@justbuffalo.org) or at the event on index cards. Following the Q&A, the author will sign books. Talking Leaves Books, the official BABEL bookseller, has copies of Ward’s books at their Elmwood location and will also sell books at Kleinhans the night of the event. Deaf Access Services will be providing on-stage ASL interpreters for the entire evening. While the event takes place at Kleinhans, they do not do the ticketing for BABEL. Tickets may be purchased online at justbuffalo.org, by calling (716) 832-5400, or at the door on the night of the event.